Celebrate historic Australia Day on the Mighty Murray, on a three-night Murray Princess Australia Day cruise departing Friday 25th January 2019. Soak up Australia Day festivities and discover the real history of the outback. A ‘fair dinkum’ Aussie good time will be had by all on the Australia Day cruise featuring the popular three-night itinerary combined with Australia Day festivities and dancing including Australia Day games like Aussie Two-Up, Aussie Quizzes and Aussie Bingo. Visit Murray Bridge and explore its township or take a tour of the historic Roundhouse; learn about the thriving ecology of the river on a guided nature walk at Salt Bush Flat and get up close to the river, its 20-million-year-old cliffs and amazing birdlife including darters, herons and egrets on the ‘Dragon-Fly’ Flat Bottomed Boat at River View Lodge. Wildlife lovers can spend a morning visiting the unique Monarto Zoo on a private Monarto Zoo Wildlife Tour where they will see Giraffes, Elands, Zebras, White Rhinoceros, Cheetahs, Lions, Hyenas and Wild Dogs. The tour is an additional $60 per person. 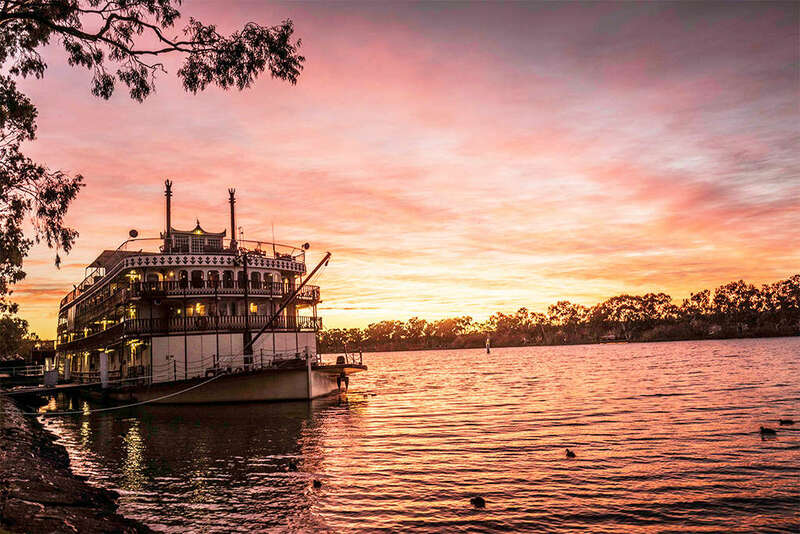 Food and wine lovers can learn more about the Murray and Riverland regions and sample some of the local produce and wines with a structured tasting event held onboard in the Sturt Dining Room. Join the Captain for a general inspection of the wheelhouse, participate in a lively Aussie quiz, play some bocce on the riverbank or relax with some fishing off the side of the ship. Relax on the open top deck or sit back in one of two air-conditioned paddlewheel lounges displaying views of the working paddle wheel and enjoy the everchanging scenery as the Murray Princess cruises past towering limestone cliffs, holiday homes, houseboats and riverbanks lined with mallee scrub, willows and red gum forests. Each day indulge in a hearty hot buffet breakfast, a two-course or buffet lunch day and a threecourse or buffet dinner. Extend Australia Day celebrations with a seven-night cruise and visit Burk Salter Winery, Ngaut Ngaut Aboriginal Conservation Reserve, the Swan Reach Museum, a Native Wildlife Shelter, see the Sunnydale Woolshed Sheep Shearing Show, cruise through Lock #1 at Blanchetown and enjoy a delicious Aussie-style barbecue dinner and bush dance on the river bank. The three-night Australia Day Discovery Cruise departs Mannum on January 25, 2019 and early booking saver fares start from $820 per person, twin share. The seven-night cruise, including the Australia Day cruise departs Mannum on January 25, 2019 and early booking saver fares start from $1683 per person, twin share. Fares include accommodation, all meals, guided nature walks, eco-excursions, onboard presentations, onboard Wi-Fi, Australia Day festivities and dancing, live entertainment, sun deck, bar, two lounges, restaurant and mini gymnasium and complimentary scenic coach transfers from and to Adelaide or secure car parking in Mannum and post cruise coach transfer to Adelaide airport if required.